Welcome back, stamping friends! Thank you very much for visiting yesterday, and making our Creation Station Blog Tour a tremendous success. I’m so glad that you enjoyed the tour, and I hope that you got a lot of inspiration for your own creating. Today I’m back with a new kind of Blog Hop; I was nominated by my good friend Buffy Cooper for the Creative Blog Hop. We’ve actually been ‘virtual’ friends for a couple of years, and I just had the great pleasure of meeting her in person at Stampin’ Up!’s Leadership Conference at the end of January. We had a great time, and it was an honour to nominated by her, as I admire her work greatly. You really need to check out her blog – just click HERE, and enjoy! The most difficult part of this blog hop was deciding what to do! Only 1 project is required, and I was determined to stick with the program! I finally decided to use one of my new favourite sets, Butterfly Basics, and a new technique that I’ve been dying to try – coloured embossing. I started with a card base of Rich Razzleberry, and used the Big Shot and Labels Collection Framelits to cut 2 panels in Old Olive and Basic Black card stock. On the black card stock, I stamped the flower image in White Craft ink, and heat embossed it with White Embossing Powder. I added a few ‘splotches’ using the Gorgeous Grunge stamp set, also in White Craft ink & heat embossed in White embossing powder. Once the embossing was cool, I used the Rich Razzleberry Blendabilities to colour the flowers, and the Blendabilities in Old Olive to colour the stems. The ink glides on so smoothly, and you get a unique look that I just love! I also coloured just the inside strip of the 5/8″ Organza Ribbon with the darkest of the Rich Razzleberry Blendabilities marker. 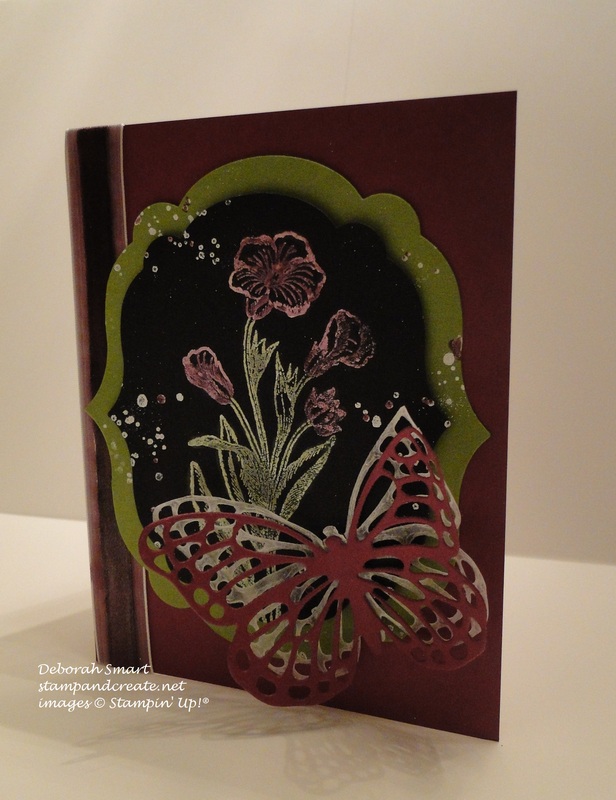 I used the Butterfly Thinlits Dies & Big Shot to cut the medium butterfly out of Rich Razzleberry card stock. I like to use a layer of wax paper between the die and the card stock; it helps release the card stock & little cut out pieces so easily! It also gives you a perfect wax paper die cut butterfly – which I layered underneath the card stock butterfly. Did you know that you can purchase the Bundle of Butterfly Basics stamp set AND the Butterfly Thinlits Dies, and SAVE 15%!? Well, my Scottish heritage can’t pass up a deal – so that’s what I did! 🙂 I decided to not add a sentiment, as I felt it would take away from the focal point, which is the flowers. Something that’s different about this Blog Hop is that we are asked to share some of our ‘creative process’ with you. I hope you find this interesting; I’m sure that everyone has a different process; some people probably think they don’t have a process (but I think we all do, in one form or another). Right now I’m challenging myself to participate in challenges! Of course, I have classes and parties to plan for, but I find that I get caught up in doing those things, and not stretching my creativity in different ways – and I like to try different things! So, participating in challenges is a way for me to do that. I’ve always loved creating things; before finding Stampin’ Up!, I had my own home-based floral business. When I had to give that up due to my carpal-tunnel and arthritis, I knew I had to find something else. Finding Stampin’ Up! has been wonderful, because it gives me my creative outlet, plus I get to interact with people; teaching, sharing and of course laughing! I need to have a ‘jumping off’ point; whether it’s a stamp set or colour that I want to use, or a card sketch – I start with one of those things, then add on from there. For example, I decide I want to use the Butterfly Basics stamp set; then I decide what colours I want to use. I choose those items, then decide on my layout, and choose the tools I need to complete my project. Louise Cyr – who has a wonderful, clean & simple style that I can only reproduce if I try my hardest! Linda Hertig Wicks – a creative, funny, long-time stamper who has a fresh whimsy to her projects. Tracy Elsom – whose relaxed, comfy style of creating as well as writing on her blog always makes me feel at home. I hope you’ve enjoyed this blog hop, and reading about the how’s and why’s of my stamping; if you’d like to share some insight into your creative process, or just let me know what you thought of this post, I’d love it if you’d leave a comment. 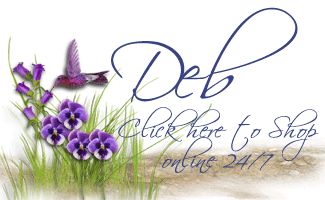 Beautiful card, Deborah!! I love the “colored embossing,” too. This is so elegant! Thanks for visiting, Buffy! Thank you for the nomination for the Creative Blog Hop, too. It was a lot of fun; answering the questions made me think about what I do, rather than just ‘doing’ it! Great post. Really ‘dramatic’ card, so lovely. Your coloring is amazing too. Great post and great card Deb. Thanks for the details on the technique.